Located at the corner of Oakwood Ave. and Freeway Dr. W. near I-280, Extra Space Storage serves residents of Orange, Ampere, and Lower Vailsburg. Locals will recognize our facility just northwest of ShopRite, Dunkin' Donuts, and the Brick Church train station. We're also accessible for residents of nearby apartments, such as Washington Towers, Prospect Park Apartments, Indigo 141, and more! A Versatile Storage Facility on Oakwood Ave. Whether you're looking for residential storage, commercial storage, or vehicle storage, Extra Space Storage on Oakwood Ave. has the self storage units and amenities to accommodate your needs! 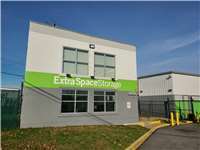 We offer storage units ranging from reduced-height 5x4 units to large 10x40 drive-up units. Units come with a variety of features, like first-floor access, elevator access, and drive-up access. No matter what you need to store, our friendly staff will help you find an affordable unit that's perfect for you! Our Orange storage facility offers drive-up access units between sizes 5x15 and 10x40. These units provide the ultimate convenience, as they allow you to pull your vehicle directly up to your unit to unload and load items. Drive-up units are also great for storing vehicles, such as cars, motorcycles, and small recreational vehicles. Extra Space Storage on Oakwood Ave. takes customer service to the next level. Affordable rates, a friendly staff, and a wide selection of unit sizes and amenities make us a great self storage solution for residents and businesses throughout Orange. Contact our facility today to reserve your storage unit! The customer service rep, Enrique was great! He was very informative and went above expectation to assist me. The facility is clean- I have not seen any trash or debris. There is equipment to assist with moving contents from vehicle to storage area. So far, my experience has been positive. Had to come share my experience at Extra Space Storage on Oakwood Ave in Orange Nj.To begin we had the pleasure of sitting down with Sue Ellen Lambert who has a warm smile and wonderful personality ,She was very knowledgeable and eger to help us find exactly what we needed. Wonderful experience keep up the good work Sue Ellen . I would like to look at my entire account including insurance without going to my file to see how much insurance I have on the storage unit. I need to make sure I have enough insurance on my property. I stored my entire household furniture at this facility in Orange for a year. This facility is safe, and the staff is always checking around to ensure safety and checking on the storage lockers. The manager and her staff I found very helpful and polite. They answered all our questions and return my call promptly. I have had a very pleasant experience and is still a customer renting a smaller storage. I would recommend this storage to anyone. This was the worst facility ever I went to go and get some of my things outand when I open the door I had rat mess all iover my things do they really think I was coming back for it No they can keep it No telling what else was in there but I wasn't bringing it home with me. Professional, Positive, Friendly Corporation,each encounter always have a positive ending. The facility was very clean that was one of my greatest problems I had with other facilities. I have a great number of thing that I really would like to keep stored clean and this facility has meet that standard. The facility is clean and nice people work there.. This facility is convenient, clean and allows me access throughout the day, seven days a week. Located between Oakwood Ave and Hickory St. Entrance on Freeway Dr West. Take Turnpike North to exit 15W. Keep straight and follow signs to East Orange and Clinton St. Follow sign up the ramp onto Freeway Drive West. Follow to Oakwood Ave. Extra Space is on right (2nd driveway) as soon as you pass Oakwood Ave. Our address is 37 Oakwood Avenue. Take Turnpike South to exit 15W. Keep straight and follow signs to East Orange and Clinton St. Follow sign up the ramp onto Freeway Drive West. Follow to Oakwood Ave. Extra Space is on right (2nd driveway) as soon as you pass Oakwood Ave. Our address is 37 Oakwood Avenue. Route 280 East to Freeway Drive East. Get off at Center St. exit. Follow to Oakwood Ave. Make left at light. The next light is Freeway Dr. West- make left. Extra Space is the 2nd driveway- our address is 37 Oakwood Avenue. Route 280 West to Freeway Drive East. Get off at Center St. exit. Follow to Oakwood Ave. Make left at light. The next light is Freeway Dr. West- make left. Extra Space is the 2nd driveway- our address is 37 Oakwood Avenue.